We offer a quick repair turnaround to limit machine downtime. Just follow the simple steps below for a 2-3 day turnaround. We will inspect the Jetnut and quote repair service by the next business day. When the repair PO is received the repaired Jetnut will ship the same day. Remove the pressure pad and seal (use grease gun). Remove bleed screw and ball (inspect area). Remove actuate fitting, using caution as they break easily (inspect thread). Thoroughly clean Jetnut, especially groove area. Inspect groove area for nicks or gashes. If groove seems to be okay, you are ready to begin repairing the Jetnut. If not, the groove walls must be smoothed using an emery cloth or equivalent. 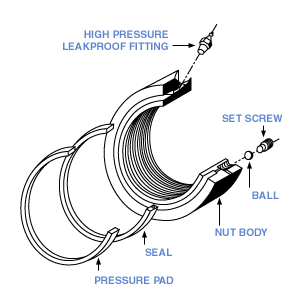 Replace the seal, and with the O-ring on the seal down and the groove on the Jetnut facing you, set the seal on the top of the groove (see illustration). The seal should look 1/2" too large. Push down on the seal until the I.D. of the seal is cocked in the groove. Then, with a flat tip wooden stick with a non-sharp edge, work the O.D. of the seal into the groove by pushing down with your thumb. Work the seal in until the seal is flush at the top of the groove area. The seal has to be pushed down about every 45° ...do not push the seal all the way down. Continue this until a small portion of the seal remains...carefully work this section into the Jetnut. DO NOT CUT THE SEAL. Once the seal is all the way in the groove area, it can be pushed all the way down, but do not bottom the seal out in the groove. Replace ball and bleed screw (do not tighten down). Replace actuate fitting (do not over tighten; snug will do). Use teflon tape on the threads of fitting when replacing. Pump grease into fitting until grease comes out of bleed. Tighten down bleed screw, hand snug will suffice.